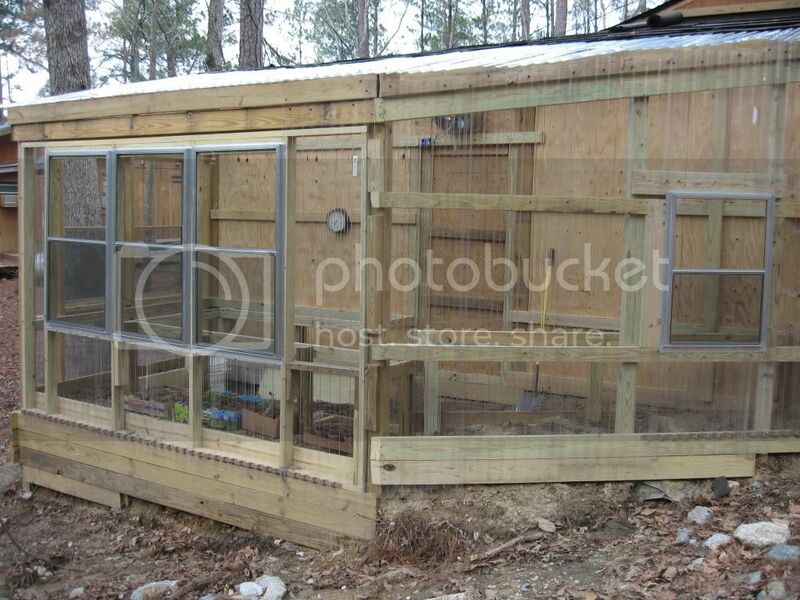 I have a funky shaped greenhouse that I will use to start plants for my garden. 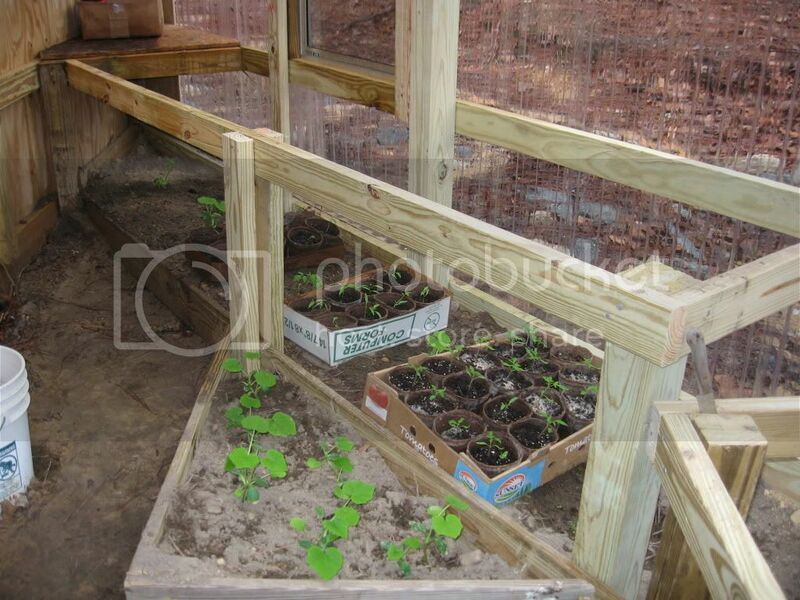 But, from a recent post by DoubleDog I got the idea to get a headstart on actual veggie production in the greenhouse. Now, I find myself looking at it and trying to devise plans to get the most production possible. Based on the pictures below what ideas do you have for more production. Three walls are open to the sun, so I think i can have some work bench on top of production. Also, I have thought of some type of hanging production, maybe a homemade "upside down tomato grower". shelves on the back wall would be good. I would say buy a heater to keep it warm! it works in small spaces, it doesn't run on much kerosene and it is worth the effort to get it. 85 is british sterling and it cost me about 50 bucks to ship, but maybe the shipping won't be as expensive for you and you can use the heater in the winter! You can also line the glazing with Bubble Wrap. Super efficient, inexpensive, great light transmission. Just make sure you include some kind of an automatic vent for those spring days when it starts out gloomy and cold and two hours later it is warm and sunny. The temps can rise 60 degrees in just an hour or two. See if this gives you any ideas. 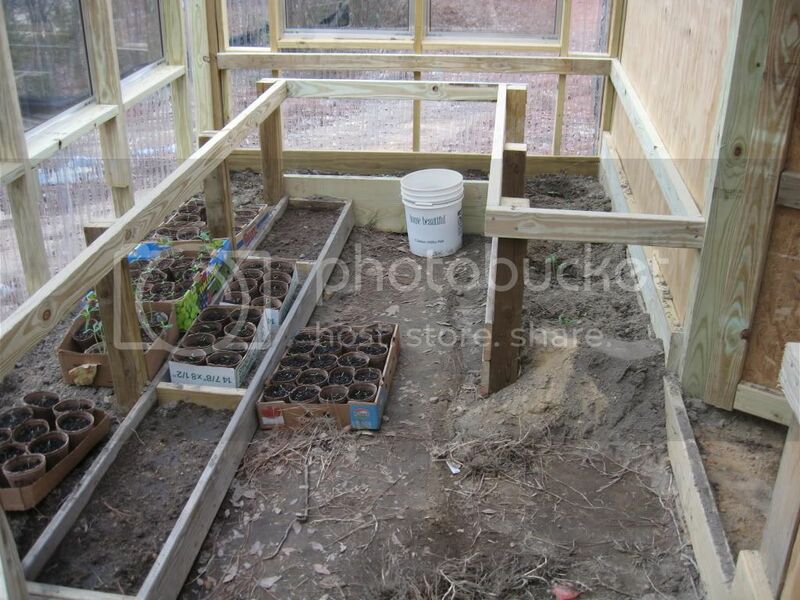 This is what I have planned for my green house. A row of 55 gallon black barrels along the back wall with a shelf over the top of the barrels to grow plants in trays. A water pump that will pump water from all the barrels through a radiator to transfer heat to the water barrels with a 70 degree thermostat to turn it on when the sun warms up the green house. The heat in the barrels will kept it from freezing in cold weather. Fan on the radiator to circulate heat to the water. Loovers and fan in the green house to remove excess heat in summer. Front wall plants growning in the soil. I want fresh garden tomatoes all winter and a few other things. Put a small fan to blow against the bottom of the barrels when the heat is 55 or more in the greenhouse. You can buy a fan switch for attic fans that a extension can plug directly into with a temp setting. The switch sells at lowes for about $25 and has settings from 60% up! I would start with Soil's idea. Paint the back wall white and go vertical with shelving. I've done a little testing in my greenhouse. The sun is so low in the sky, this time of year, my shelves maybe only 2ft apart. You may have to pull the flats out to be watered and returned. I'm really liking my Bottom Water System, I will probably install a second about 3ft above it. another thing to add, if you are serious about this and want a your greenhouse to be cooled and heated on the cheap. you should look into Subterranean Heating and Cooling System, its an amazing system. every GH i build from now on will have it. soil wrote: another thing to add, if you are serious about this and want a your greenhouse to be cooled and heated on the cheap. you should look into Subterranean Heating and Cooling System, its an amazing system. every GH i build from now on will have it. Well, I was not planning to build it like Epcot's garden, but some cheap heat would be nice. This year, late start, i am limited to expensive electric heater, but I plan to run a propane line, perhaps use the black barrell method. I have an exhaust fan installed but not yet wired. I have tested it with the "wires straight into a plug" method and it will move some air. Thank goodness I have enough air gaps in the construction or I might look out one day and the plants will look like they are in shrink wrap. I will probably go with the upper shelf idea, as that location really will not restrict sun from other areas of the green house. Had not thought of painting the wall white, but if that will help then I will definitely do that. I will try to get some new pictures today as the little plants are enjoying their new room so far. Thanks for the ideas, keep 'em coming. Another thing you could try is to put up a layer of 4 or 6 mil plastic on the inside of the wall. You will want a gap of at least an inch. This gap of air between the glass and the plastic will act as insulation. Thank goodness I have enough air gaps in the construction or I might look out one day and the plants will look like they are in shrink wrap. Looking good. Could you name off some of your starts. 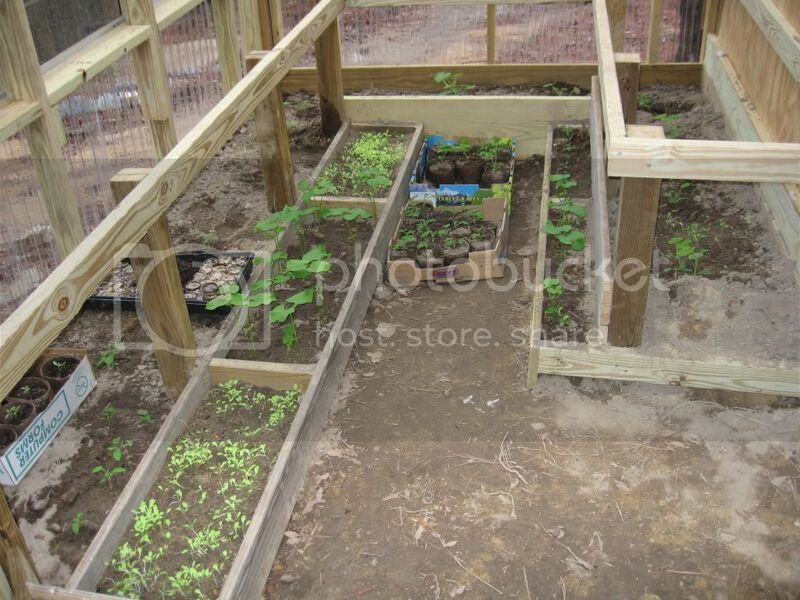 I see tomatoes, beans and maybe lettuce. What is in the triangular bed? lakngulf wrote: ... protection from the chilling wind. That is a great observation. Not discounting the other benefits of a greenhouse, but wind protection alone makes a huge difference in the growth and survival of many plants. I had no problem thinking of that benefit as I was working this weekend on transforming a screen porch to a full window florida room. I DID NOT have the protection from the chilling wind!! Eric, some of the plants are too small to tell, but I do have the name written on each pot. And my wife asks me each time what type of tomatoes are planted in the boxes. I remind her the name is written on the 2x4 above. The triangular box (I am a square peg in a round hole also) are straight neck yellow squash. They were just out growing the pot so i put them there to go to the garden later, if they do not get too big. Other starter flats have parsley, thyme, oregano, cucumber, banana pepper, and mix color bell pepper.